If you've been waiting for a serious contender to arrive in the budget tablet market, then you may be pleased to hear this: Amazon's revamped Kindle Fire and Kindle Fire HD 7 are now in-stock for a wallet-friendly $159 and $199, respectively. 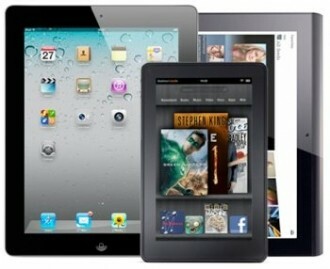 The company's tablet refresh introduces a few new options, but also updates the original Kindle Fire. Amazon claims the updated model is 40 percent faster, sports twice as much RAM, enjoys better battery life and comes with 8GB of internal storage. Amazon has also slashed the price to $159, making it possibly one of the best values in tech out there. Also on the list of Amazon's new tablet devices are the readily available Kindle Fire HD 7 and the Kindle Fire HD 8.9 with and without 4G LTE. The 7-incher is powered by a respectable dual-core 1.2GHz TI OMAP processor, a generous "11 hour" battery and comes in 16GB and 32GB flavors. For anyone eyeballing the Kindle Fire HD 7 though, don't forget about the Nexus 7. Google's $199 tablet offers more kick with a Tegra 3 and ships with Jellybean for an ostensibly pure Android experience. While the 8.9-inch Fires won't see the light of day until November 20, Amazon is welcoming onlookers to take the plunge and pre-order their own. The Kindle Fire HD 8.9 is set to rival the iPad 3 by being thinner, lighter, faster and could even be equipped with a better display, according to ExtremeTech's sources. Amazon's flagship Fire will also compete with the iPad 3 in terms of features and price, boasting a very attractive MSRP of $299. The optional cellular data plan is equally attractive, $50 buying 250MB of data per month for one year. Also, don't forget: California residents will have to pay state sales tax on purchases from Amazon beginning September 15. If you happen to be in CA, that means today marks your last day to purchase your Kindle Fire tax-free.